Amsterdam’s MC Theatre will be brimming with musicians, dancers, theatre makers and artists across a great variety of different disciplines from 15th to 19th May 2013. 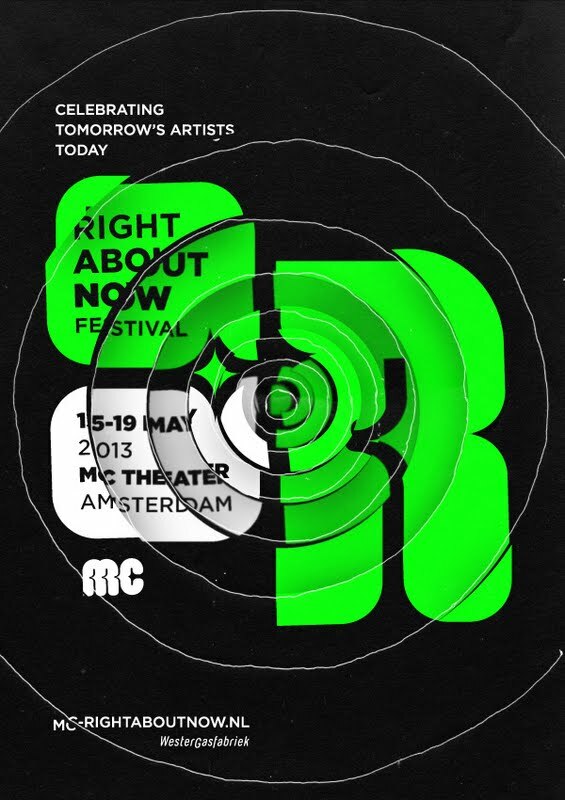 RIGHTABOUTNOW is one of MC’s annual festivals, including an evening and night programme with an innovative blend of various different forms of art, cultures and subcultures, all under one roof. The artists performing at RIGHTABOUTNOW are not aware of any limits. LikeKarriem Riggins, drummer and producer, who is just as happy to serve the hip hop scene, as he is to perform in front of a jazz audience. Or like the acclaimed French choreographer and dancer Anne Nguyen, who will be performing two pieces together with her Compagnie Par Terre, within which breakdance and modern dance will merge into a new language together. MC will also be showcasing an abundance of young Dutch theatre makers during the RIGHTABOUTNOW Festival: Allang Vrienden (Long-Term Friends) and theMime Theatre Group Botlek will be performing their new shows, which have both been developed with MC’s support. MC’s successful Nina Simone (A)Liveshow will also be revived during RIGHTABOUTNOW, after two sold out series in 2012 and a successful tour in Surinam. RIGHTABOUTNOW’s evening and night programme is razor sharp and pulsates at the seams with all the bands, producers and DJ’s who will be mixing styles and coming up with innovative results. A few of the acts which will be performing live include: singer-songwriter Dan Bodan, Zulu Guru, drummer and producerShigeto, the Rotterdam Re:Freshed Orchestra, Karriem Riggens and Spoek Mathambo . The DJ’s: Theo Parrish, Rob Manga and FunkinEven. The cellist Chris Lancaster will be responsible for Wednesday 15th May’s opening act, who has turned his classic cello into an electronic marvel and which can actually sound like an entire orchestra. He will be accompanying FlexdanserJay-Donn. Flex is a new East Coast street style, which continues where krumping ends. The opening show is Autarcie by the French group Compagnie Par Terre. Before and after the opening the crowd will be taken on a sonic journey by Rich Medina and Akalepse through hip-hop, house, Afrobeat, funk and soul, unearthing one musical gem after another. Public Transport :Bus – Line 21, stop Van der Hoopstraat. Tram 10, stop Van Limburg Stirumplein.